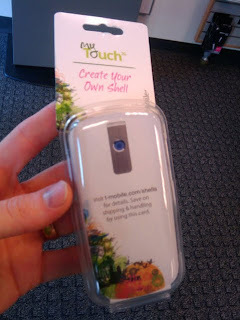 Not unlike the Photoshopped toy box for The Invisible Man that depicted an empty plastic container for an action figure that you couldn't see, T-Mobile is selling empty cases in their brick-and-mortar stores of cell phone shells that you design online. Although it might be hard to tell from the picture, what you're seeing is literally an empty case around a cardboard cutout which tells you that you can build your own protective case online and have it shipped to you. Hopefully this is never actually purchased by the customer, since it would make sense not to create hundreds of thousands of empty plastic cases, but who knows? In a world that creates "All Natural" plastic pick-up sticks, anything is possible. There were four of these empty boxes on the hangar, so at best there were probably only several thousand of these wastes of space created. Way to think about the environment, T-Mobile.